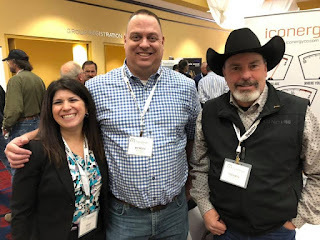 Mesa County Commissioner Rose Pugliese, Logan County Commissioner Byron Pelton and Rio Blanco Commissioner Shawn Bolton at CCI Foundation's winter conference. Over 400 commissioners and other county officials from across the state met in Colorado Springs, Colo., Nov. 26-28 for Colorado Counties Inc. (CCI) Foundation's annual winter conference including Mesa County Commissioners John Justman and Rose Pugliese, County Administrator Frank Whidden and other Mesa County leaders. The conference featured meetings on the opioid epidemic, Gallagher Amendment, landfills, and other important issues affecting Colorado counties. Keynote speakers at the winter conference included Colorado Governor-elect Jared Polis who outlined his vision for the state's transportation issues. CCI is a non-profit association that brings all 64 Colorado counties together to work on shared issues, and whose purpose is to provide assistance to county commissioners and to encourage counties to work together.